Today marks the third anniversary of the day we lost our first baby. Squooshy was a surprise of hope for us – we had almost given up on ever getting pregnant! The day I found out I was pregnant is still one of my favorite days, even though it is now tainted with the knowledge of how it all ended. I thought I was having serious heart problems or something. I was so tired all the time. I was sick at my stomach. I could feel my heart racing at times. On July 1st, called Dr. Wilk on my way to work to make an appointment. That afternoon he made me pee in a cup, even though I told him “I never pass these tests.” I can still hear him coming back into the room and saying, “How do you feel about being a mother?” I was shocked. SHOCKED! After years of trying (temperatures, calendars, drugs, etc. 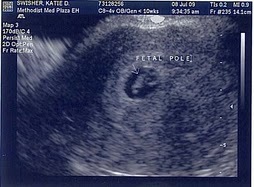 ), I was still surprised to find out that I was pregnant. God is so funny sometimes! I sobbed in his office, and he and his nurse hugged me over and over again. I remember the moments when I told my parents, my siblings, my friends, my coworkers. It was a great time. I was almost 11 weeks along in my pregnancy when I started bleeding. I called my OB, and she suggested I come to the hospital. We made it to the hospital in Crawfordsville just in time. A few moments after we arrived, I was on the table in serious pain, and a doctor was gently telling me what I already knew. I’ll never forget the nurse who held my hand and offered comfort. I’ll never forget the hot, wet tears rolling down Matt’s face onto my hospital gown. I’ll never forget the humility of having Matt helping me clean up the mess that was left after the death of our baby. I’ll never forget the looks on the faces of my mom and sister as they entered the room just an hour later. I’ll never forget sleeping in the maternity ward that night, with Matt laying in a recliner chair right next to me. We held on to each other every moment of that night. I woke up regularly throughout the night, feeling as though I was in the middle of a bad dream. I’ll never forget the peace I felt the entire time we were at the hospital though. There was no question that God was there with us. It has been a difficult three years since that day. Three more miscarriages have followed – each one painful and difficult, but none have been quite as devastating as the first. Perhaps we just have become desensitized to it a little. We remain hopeful for a family – no matter how it may come. In the meantime we enjoy being an aunt and uncle to 5 amazing nieces and nephews. They bring such joy to our lives. This entry was posted in Babies by Katie. Bookmark the permalink. Hey Katie I’m praying for you! Love you lots! Katie, we are grateful for you and Matt and your faith witness in the midst of sorrow and frustration. Lifting up prayers for you today and thankful to be able to think of Squooshy with you today. Katie, what a beautiful tribute to Squooshy. And what a testimony of trusting God, even in times of deepest pain and despair. You and Matt are in my prayers as you wait on God to see what He has in mind for your “family.” Whatever that turns out to be, I know you will honor Him and He will be glorified.